ELS Agency is a copywriting and translation agency with offices in Edinburgh, UK and Milan, Italy. They provide digital marketing translation and copywriting for e-commerce companies and websites in a wide range of languages. For ELS, we automated everything that is possible to automate in their work process: from project management and project status to tracking profit per client and tracking reminders. To achieve full automation, we built a custom automated cloud-based translation management and ERP system, which is a suite of 2 main components: a) management of core business processes and b) automation of the language translation workflow. The first part allows ELS to automatically collect, store, manage, and interpret data from many business activities: project management, resource management, financial management, report automation, sales management and client/user management. The second part of the software is a combination of process management technology to automate workflow and a database that supports translation project management. The Dashboard enables ELS to visualize and analyze data by creating insightful reports to track key performance indicators (KPIs). The client can use a variety of charts, KPI widgets, and tabular view components to customize the dashboard with the insights they most frequently use. 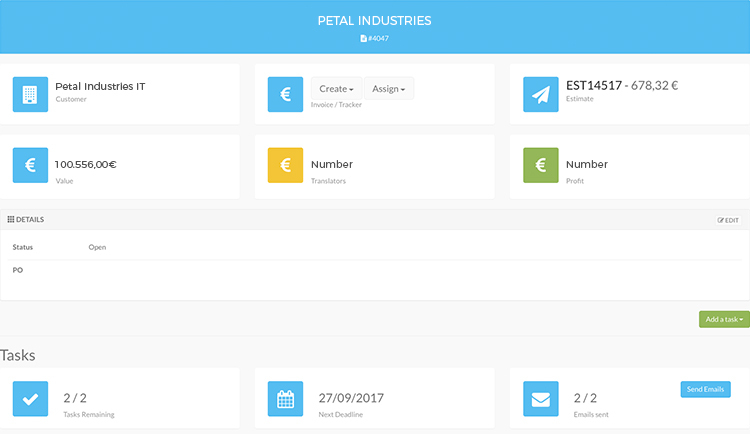 The Jobs part of the system enables ELS to view and easily manage quoting, invoicing, and multiple service providers per single job. Other statistical features like profit and job value create a fully integrated job management solution. When you have many translators working on one project at the same time, there is a chance of double paying a PO. Automatically tracking incoming orders by matching them to the POs, helps simplify inventory management and guarantees that all requests are paid correctly. The Customers part is developed to manage a company's interaction with current and potential customers. Lead status and automated email communication with clients help in the conversion process and leads/customers data analysis. If you have a lead that 'starts getting cold', meaning there was no communication for some time, admin receives an alert on the Dashboard, so they can react in time. 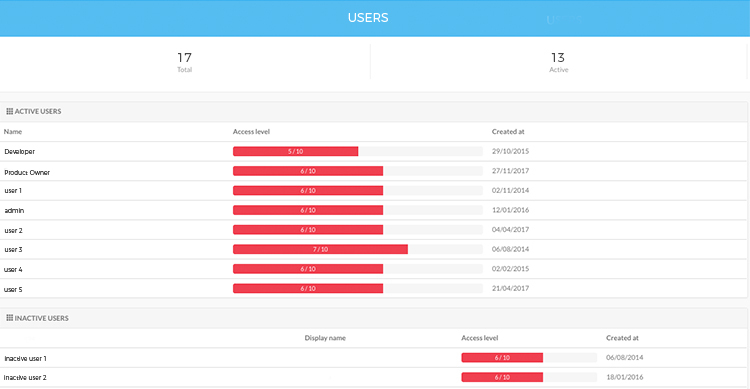 The User Management part of the system is an authentication feature that provides administrators with the ability to identify and control the state of users registered into the application. ELS can create a new translator profile, insert personal information and translation details. They can also see all projects assigned to a translator and advanced data on the translator-client relation. 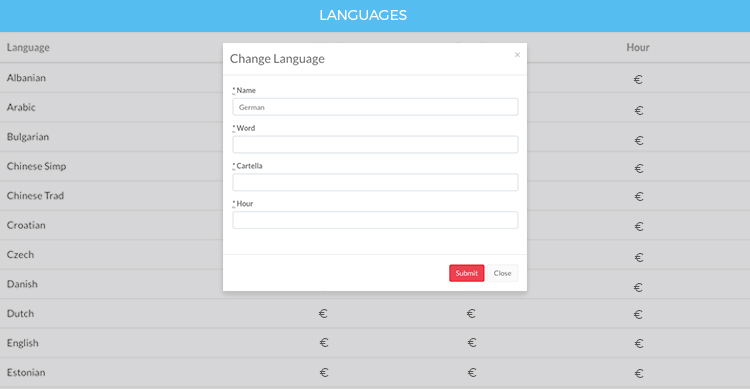 The client can insert all languages and prices per various units. They can also generate various reports related to language frequency and various dynamic variables such as translator, profit, and project duration. The Bills part of the system is a simple and organized place for all payment and tracking features. Besides bill management, alerts are sent, so bills can be paid and charged timely to ensure payments are processed on time. 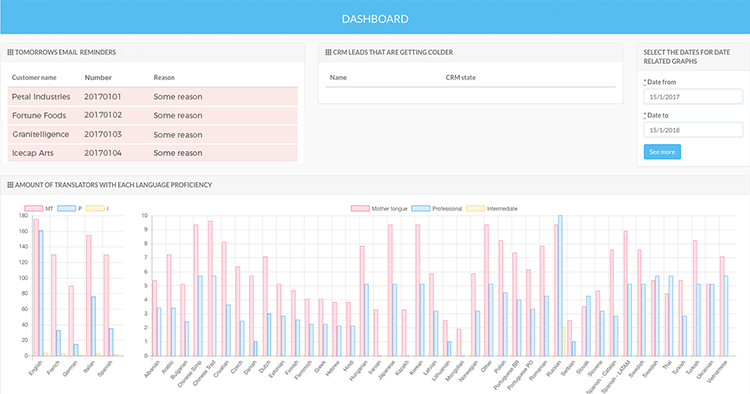 The Reports part is a solution for creating, managing, and publishing reports, visually presented on a dashboard. You can upload or generate any type of documents, such as source language and translation document. The system will instantly update your translation jobs, POs, bills or any other document without losing any work.